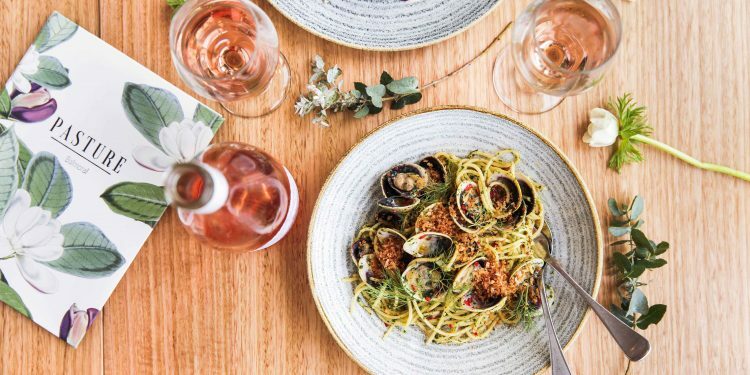 In the suburb that houses more cafes than almost anywhere else in Sydney, if you’re a recently opened cafe and are already making a big splash – you may as well have won an Oscar. Mosman is the land of three things: coffee, Range Rovers and Cavoodles. Amongst the bustling scene of mothers in active wear, beach-goers, and the Rose-drinking-food-obsessed, you’ll find that coffee (cafes) rule the roost. One does not simply stroll down Military Rd without a takeaway coffee in hand. So when we heard a new cafe had joined the pack, we admit we were skeptical. Many cafes have come, have opened, and have consequently closed. However, after a morning of delicious food, coffee even a coffee-snob would love and fantastic service, all our skepticism’s had gone. Pasture of Balmoral may or may not be in the best location a cafe could ask for: perched perfectly in an early 1900’s structure on Balmoral Esplanade. The interiors and fit-out are a masterpiece on their own, you can’t help but feel you’ve walked into someone’s Pinterest feed or the Vogue Living of cafes. 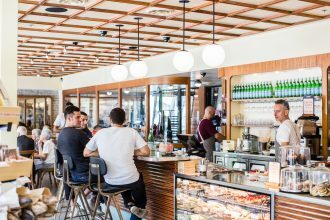 Gentle accents of greenery and straw compliment the Victorian-style ceiling roses and original timber flooring of the structure; while exposed pipes in the kitchen and shiny coffee machines remind you that Pasture means business. 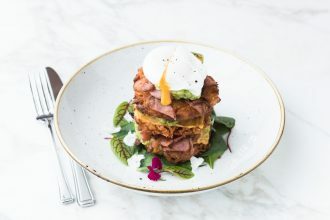 The modern Australian menu stretches across breakfast, lunch and dinner – so like any normal humans on a rainy Sunday morning, we opted for brunch. The menu itself is a designers dream, it’s so pretty it’s almost odd – menu’s aren’t meant to be that pretty! (Refer to the image above if you don’t believe us.) We kicked off with a round of coffees, which came quickly and hot, in sweet ceramic cups which just added to the aesthetic. The breakfast menu is varied and caters to all the weird and wonderful tastes, allergies and of course, diet of the week. We tried the House Spelt Crumpets with honey, citrus ricotta, seasonal berries, Rhubarb and lemon myrtle, and the special of the weekend, baked eggs in capsicum and chilli, with sourdough for ‘soaking up’ purposes. The food was prompt – which is an ever important factor on a rainy Sunday – it was fresh, it was delicious and it was just the right amount of food to clear the plate. Were we to go back, we’d likely try the Truffled Eggs with prosciutto and pecorino, and the chilled Coconut Tapioca with chia seeds, seasonal fruits, puffed buckwheat and kaffir lime leaf powder – we saw both and had our stomachs not been so content, would’ve considered seconds. Adding to the brilliance of Pasture, they’re also open for dinner, Friday, Saturday and Sunday. We’re yet to try it but we did take a sneak peak at the menu and needless to say, we’ll be heading down shortly. The dinner menu offers a range of fresh and seasonal meals, such as Salmon and Fennel, Salsa verde Chicken and pan roasted Snapper. There are a mix of entrees which look impressive and smaller plates that sound tantalising, plus a drink menu which is bound to satisfy every cocktail, wine and spirit craving that enters the compound. If you get the chance, sit upstairs and take in the view – a space which is also available for function hire. We could sit here for hours and tell you how much we enjoyed ourselves – but no one has the time. Take it from us, the staff is lovely, the food is delicious, the coffee is perfect and if you’re lucky enough to meet the owner – he’s a ray of sunshine. Combined with the waterfront views of Balmoral Beach and the option to wander down the Esplanade with your coffee in hand, we can’t think of a better spot to spend your weekend mornings.